Today is the final day for my Otters Kickstarter campaign, so if you haven’t checked it out yet, please go do so! The project is almost 500% funded, which is wonderful and humbling. 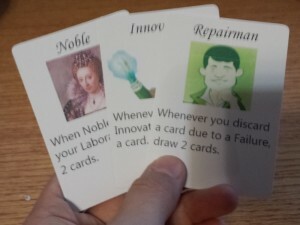 Speaking of humbling, I also wrote a blog post on my board game site, Clay Crucible Games, about my experience in running what I’m calling a “humble” Kickstarter campaign. While it’s mainly written from the point of view of a board or card game publisher, it could be relevant for RPG folks as well. Otters from Clay Crucible Games is on Kickstarter! Hello RPG fans! Yes, my board game blogging is primarily over at my board game company site now, Clay Crucible Games. But I thought you, my original readers, might be interested enough in this topic to justify a post here as well. My first Kickstarter project is live! It’s a kid-friendly card game called Otters. If you have kids who enjoy card games or you just think otters are adorable (as I do), please take a look and help me get the word out there! Hi all! 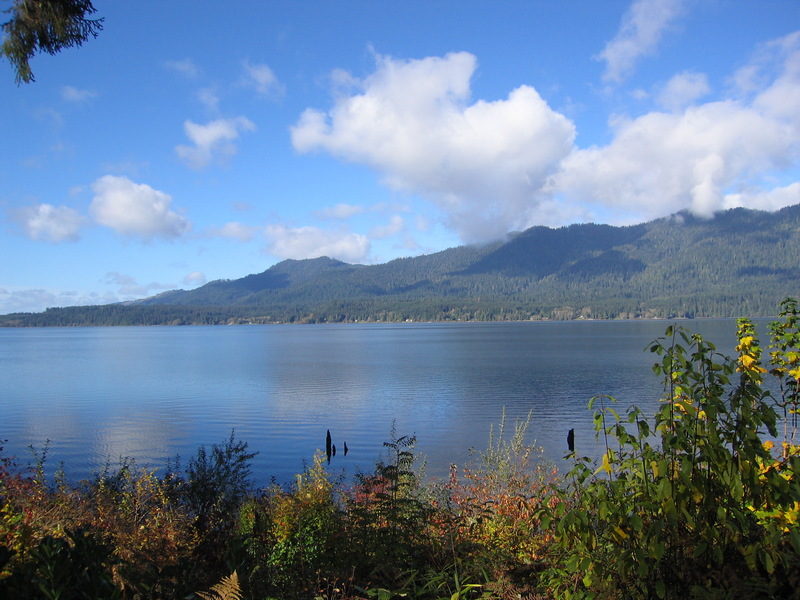 This is a bit of a meta post, about my blog itself. I started Online Dungeon Master back in 2010, when I was fairly new to Dungeons & Dragons and was starting to run D&D games online. I didn’t find a ton of blogs to teach me specifically about how to do this, so I decided I would start my own blog, sharing what I learned as I went. Online DM now has a ton of tips for playing RPGs online, lots of specifics about MapTool in particular, bunches of free maps, and even some free adventures. Just yesterday I received an email from someone who had discovered my Staff of Suha adventure trilogy and was loving it; that made my day! In mid 2012, though, my gaming life took a left turn. 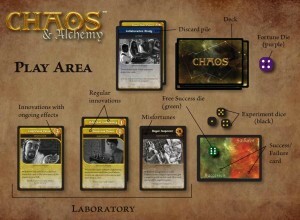 I came up with the idea for what would become my first game design, Chaos & Alchemy. I started blogging about the development and publication process of that game, which has since been picked up by Game Salute and very successfully Kickstarted. Game Salute will be getting out to backers sometime in the next few months, and I’m excited about that. The problem, though, is that my blog is called Online Dungeon Master, but I don’t actually play much D&D (or any RPG) anymore, and none at all online. When I blog, it’s about board gaming. 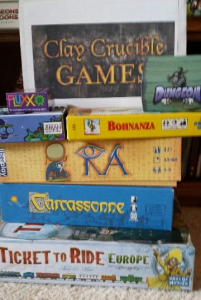 So, I’ve decided that it’s time for me to move my board game blogging over to my board game web site, Clay Crucible Games. I’m not going to remove any of the content from Online Dungeon Master, but I do hope to mirror all of the board game content eventually over on the Clay Crucible site. And future blog posts about board games will originate there. For a little while, I’ll still post a notice here on OnlineDM whenever I put up a new post on Clay Crucible, but eventually I’m hoping that my readers who are interested in board games will just drift over to the new site. And on that rare occasion that I do have something to say about RPGs, I’ll write it right here, just like I always have. 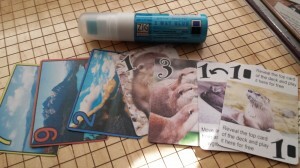 So, on that note, I put up a new board game post on Clay Crucible today, providing an update on my NaGaDeMon project, Otters. It’s ready to go on Kickstarter, and I plan to launch the campaign in late January or early February. I hope you’ll check it out! 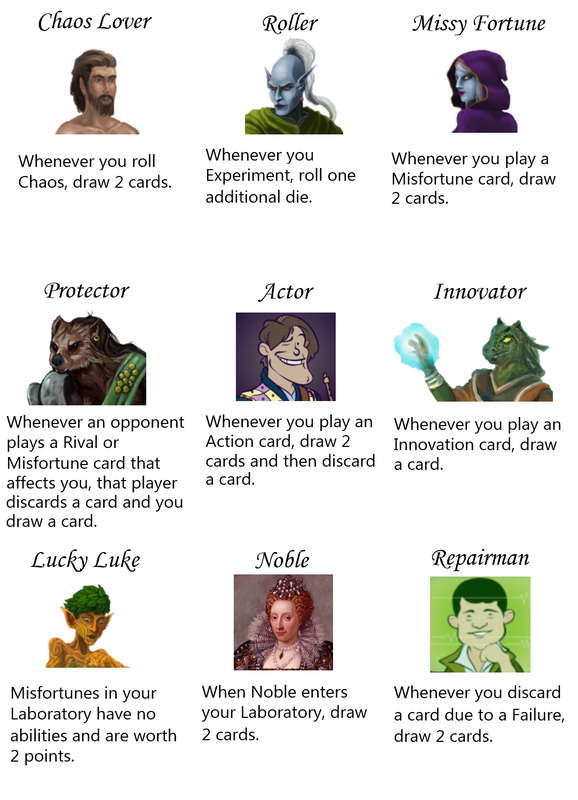 Many game designers are going to need to create prototype cards at some point. You have choices about how to do this. Some people start with index cards and markers – a fine place to begin. 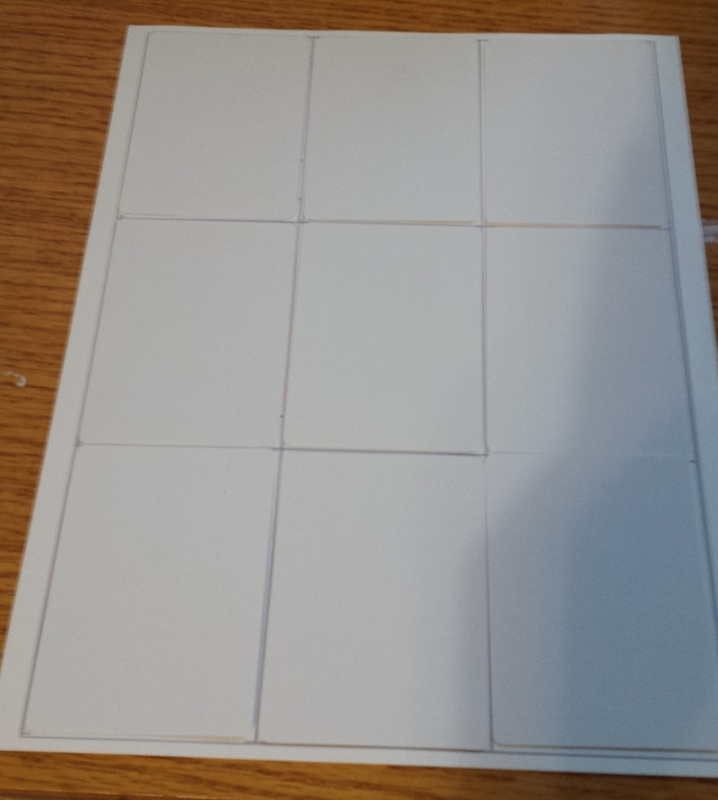 For me, I tend to start with a simple Excel template (no art) that lets me print out a page with a dozen cards, cut them up, and drop them into sleeves with Magic cards. Eventually, I get to a point where I want to make better-looking prototype cards, but not to the point where I want to order cards from The Game Crafter or anything like that. What to do? For several months this year, I went with stickers. You can get Avery name badge labels that are just the right size to stick on a poker-size card (2.5″ by 3.5″ – the size of a Magic: The Gathering card, for instance). 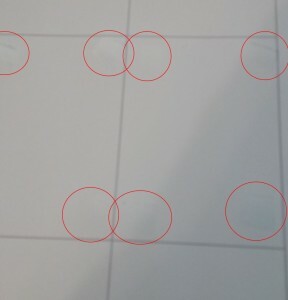 These come on sheets that are ready to run through your printer, and you can even get templates that size everything perfectly. There are two problems with this approach, though. The first is cost: Each sticker will run you about 8 cents apiece based on the current Amazon price of $32 for a box of 400 labels (50 sheets, 8 labels to a sheet). That doesn’t even count the cost of ink to print on these cards. Since I was using blank white cards from the Game Crafter (about 2 cents apiece when I bought them; looks like they’re 2.5 cents now), I wanted to print directly onto the cards. I couldn’t find anywhere that taught me how to do this, so I figured it out for myself. Now I’m teaching you. Real designers will use things like PhotoShop and InDesign to make nice-looking cards. I do have an old version of PhotoShop Elements that I use near the end of this process (as you’ll see), but I like using Paint.NET. It’s a free program and I find it to be very user-friendly and flexible. My template basically consists of a 3 by 3 grid layer to guide my positioning of the cards beneath. The file is at 150 ppi (so, not professional print quality, but plenty good for prototyping), and it’s 10 inches tall by 7.2 inches wide. This means that each card is 2.38 inches by 3.31 inches. I’ve found this to be a good size for cards that I want to drop into sleeves with Magic cards. However, I want them bigger when it comes to printing on the actual physical blank cards. From there, I manually create cards by typing in text, coloring backgrounds, adding picture, etc. 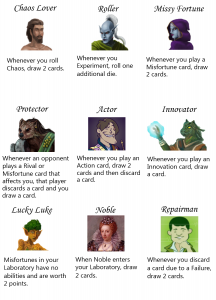 Here’s a sample page from the Apprentices mini-expansion for Chaos & Alchemy that I’m currently prototyping. Now, the one thing I don’t love about Paint.NET is that I have a terrible time trying to print from it. 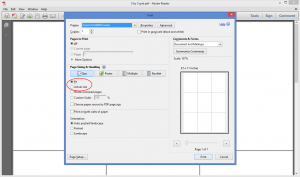 Thus, I copy the merged image from Paint.NET into Adobe PhotoShop Elements and save it as a PDF. That’s what I’m going to print. 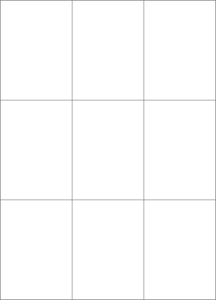 Also, to get a clean printout without grid lines, I want to save a version of my cards without grid lines (just hide the grid layer in your file). 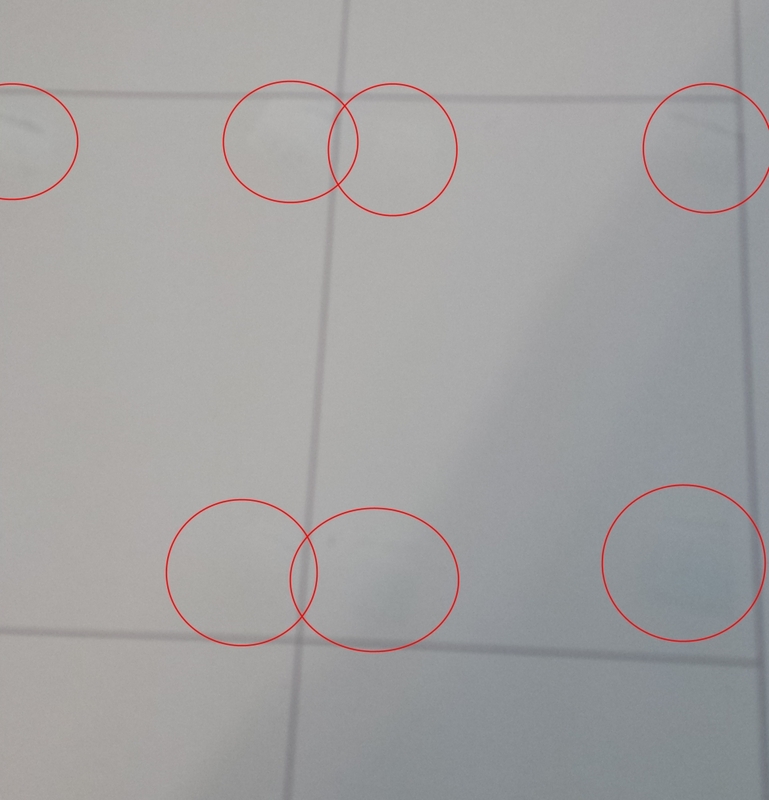 So far when I’ve done this step, I’ve printed the actual full image with the words and pictures and everything, but I’ve since realized that I could instead just print the grid. As I mentioned, I’ve sized this file so that it works if I want to print on regular paper, cut it up, and drop it into sleeves with Magic cards. But if I’m printing directly onto full-size poker cards, I want the image to be bigger. 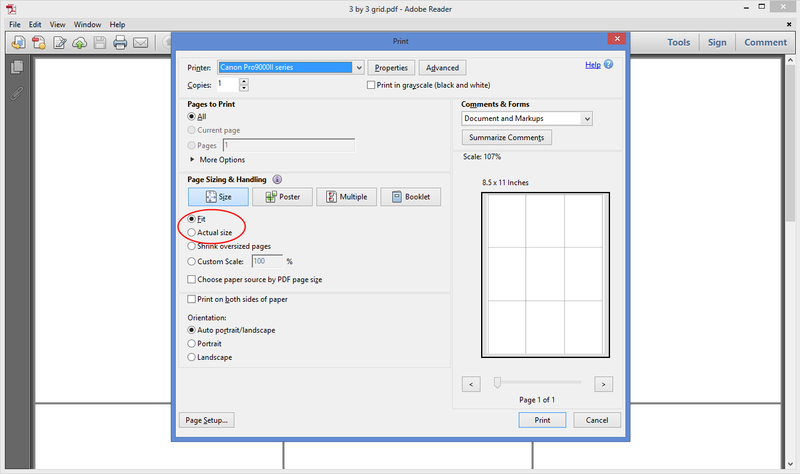 Fortunately, I’ve found that if I just tell my printer to use the “Fit” option when printing from Adobe Acrobat Reader rather than the “Actual Size” option, things work perfectly. 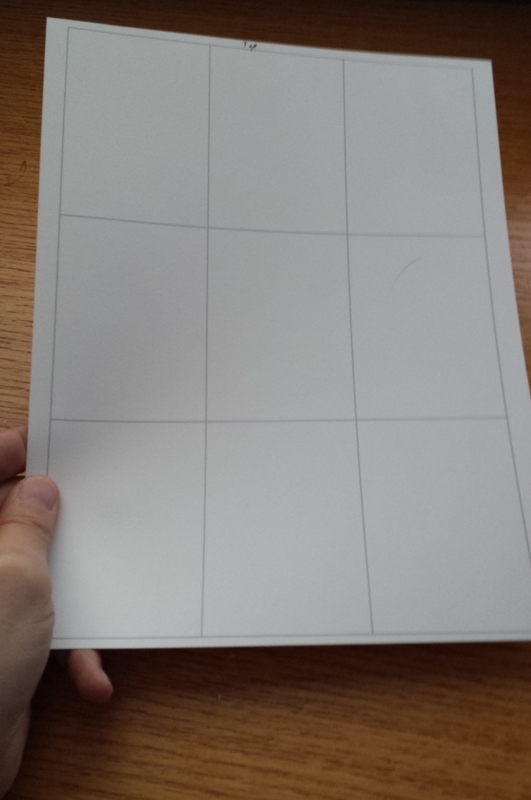 This leaves me with a piece of card stock with a blank grid on it. I made a little note to remember which side is the top; that’s the side that goes through my printer first (it’s more or less symmetrical, but better safe than sorry). 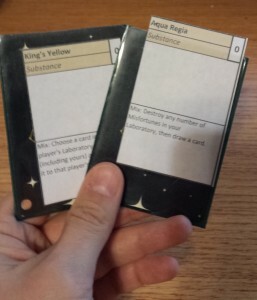 This was the piece of the process that I struggled to find: Glue that would hold the cards in place on the template as they went through the printer, but would let them go cleanly afterward. I went to a craft store, and someone pointed me toward ZIG Memory System 2-Way Glue (I use the broad tip version). When you put this glue on your card stock, it will be blue at first. But if you wait a few moments, it will turn clear. The beauty of this type of glue is that when it’s clear, it forms a temporary bond. Perfect! I’ll note that when I first tried this stuff, I smeared it all over the template. That turned out to be overkill; a bit in each corner of each card does the trick much more cleanly. Pretty straightforward. Make sure you press on each corner of each card a little bit so that it will hold. If you’ve positioned everything properly, this should work like a charm. No need for more glue! I’ve done five or six pages of cards in a row without having to worry about reapplying glue. I imagine you could do a lot more than that if you wanted to. First, let me clarify that this is only appropriate later in the development process, when you want some nicer-looking cards than the scraps of paper in sleeves approach. Second, this is not the only approach. I know some folks will print cards on heavy card stock and then cut them out, even rounding the corners. I’m sure that’s a great approach; I haven’t done it myself. Third, yes, you only get nine cards at a time this way. 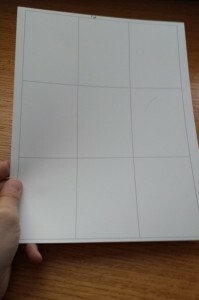 It’s still pretty quick to do, but the process is stick blank cards on the grid, print one page, peel the cards off, repeat. If you’re doing 200 cards, it will get old. 50 isn’t bad at all, though. And it’s no slower than stickers. Fourth, this works best if you’re okay with a white background on your cards. I’ve tried it with borders, and it can work if you’re really careful, but that’s tricky to pull off. With white borders, even if your card is shifted a bit on the template, it’s not a problem. Fifth, I recommend printing on “draft” or “fast” quality. Blank cards aren’t the same as photo paper, and even on “standard” rather than “high” quality, things can come out a bit muddy. Also, it takes longer for the ink to try if you go above “draft” quality, at least on my printer. Sixth, I’ve only tried this with a color inkjet printer. I have no idea if this would work on a laser printer. In the end, I’m really happy with this approach. With stickers, the extra thickness made the cards a bit weird to shuffle; that doesn’t seem to be the case with this approach. It’s cheaper, and it feels less wasteful. If anyone else tries this approach to making some nice-looking prototype cards, I’d love to hear about it! P.S. I’m still eager for people to try the print-and-play version of Otters. Download the cards here, and download the rules here! For Chaos & Alchemy, I worked with a friend who is also a professional graphic designer, Bree Heiss. You can see my post about her awesome graphic design work on the game here. Fortunately for her, Bree now works for Wizards of the Coast, doing awesome graphic design work on their games. That’s a bit unfortunate for me, though, since it means I need a new graphic designer. I put out a call on Twitter, asking if anyone had any recommendations for graphic designers. Several recommendations came in, and I followed up with three different designers. Ultimately, I decided to hire Dane Ault. You should definitely check out some of his earlier work over on his portfolio page. Dane has done a lot of work for kids, and I love his aesthetic. 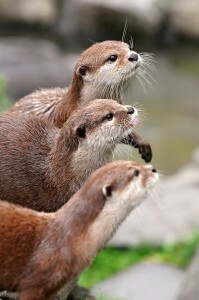 I almost regret that I’m using photos instead of illustrations on Otters, since Dane’s illustration work rocks. But, since I want to get this game out before the end of the month, the photos are much faster to work with. While the graphic design isn’t finished yet, Otters is completely playable right now with my own (kinda crappy) graphic design. If you’re interested in trying it out, you can download a PDF with the cards (and my experimental “rules on one card”) right here! If you’d like some more detailed rules (which would probably help), you can download the rules here. I’d certainly love any feedback that you might have, especially if you try Otters with kids. 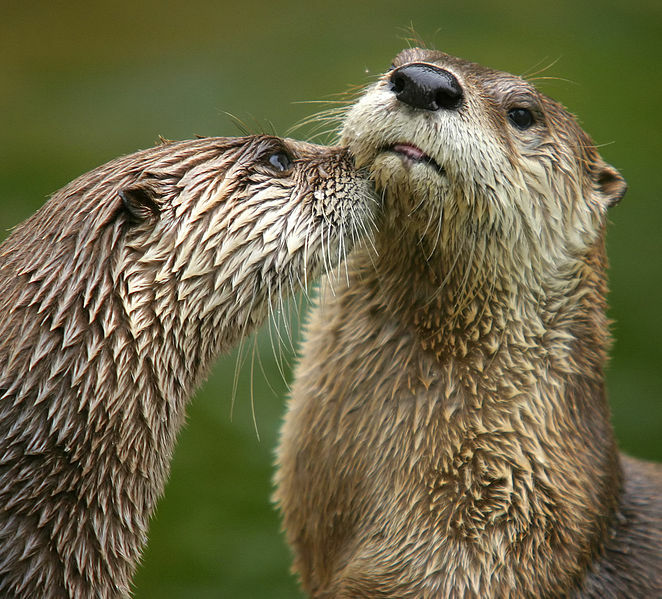 In the spirit of completely making a game for NaGaDeMon 2013, I’ve decided to dive all the way in with Otters. You can read part 1, about the idea behind the game, here. As a recap, Otters is a simple, kid-friendly card game that’s mechanically inspired by Smash Up (but greatly simplified). My initial play tests have left me pretty darn satisfied with Otters the way it is right now. So what’s next? Let’s publish! To be clear, this is a little nutty, yes. Generally a game needs tons and tons of playtesting. But this one is very simple, and it just does what I want it to do as-is. Now, if I’m going to get a published, purchasable game done by the end of November, I’m not going to have time to commission a bunch of illustrations for the cards. 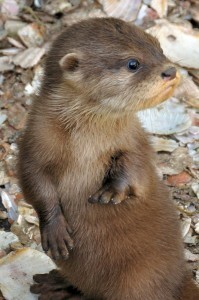 That’s okay, though, since part of the inspiration for Otters was how much I love looking at photos of otters online. 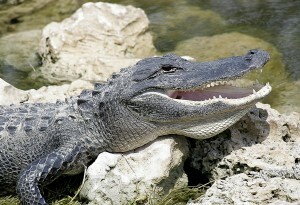 Of course, if I’m going to be able to use photos, I’ll have to license them. This is new to me. I started by going to DeviantArt (an awesome web site when you’re looking for artists) and finding a photographer with otter photos that I liked. I sent a message via DeviantArt’s system and later followed the photographer on Facebook and sent another message… but no response. Since I’m trying to move quickly on this game, I had to try something else. 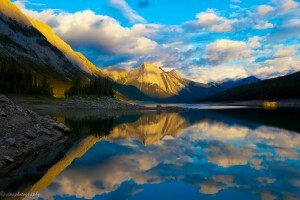 Some other designers had suggested I consider stock photos, such as from iStockPhoto or Shutterstock. Unfortunately, Shutterstock does not allow their images to be used on merchandise, including game cards, and iStockPhoto only allows such use if you buy an Extended License, which appears to cost about $200 more per image. 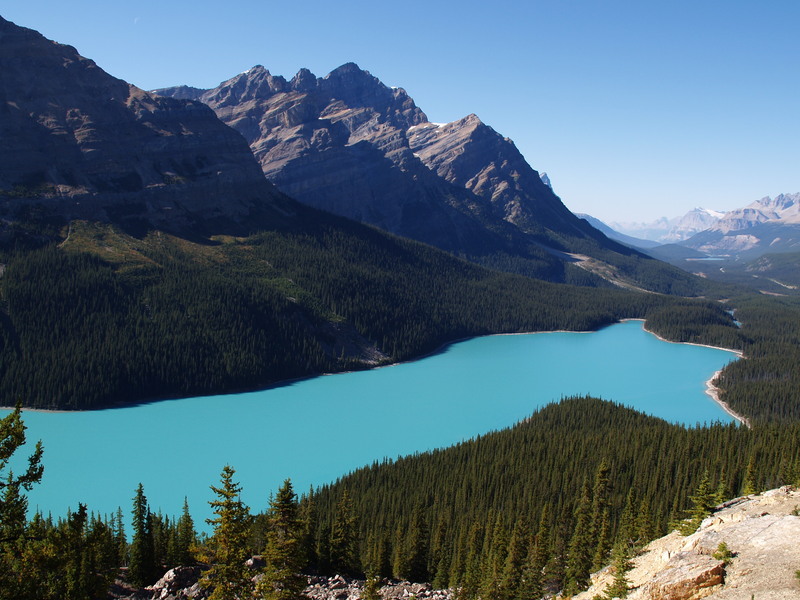 Creative Commons – woo hoo! Finally, I realized that the power of the open source movement could help me here – Creative Commons! I’m no intellectual property attorney, but the basic idea behind the Creative Commons licenses (there are different versions out there) is that you can put a creative work in the world and allow people to use it for various things. In some cases, people will even let you use their Creative Commons licensed stuff (like photos, but also music and more) in commercial products. Frequently, there’s a requirement that you provide the creator with credit for their work. 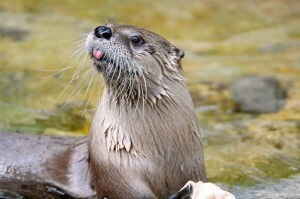 And as it turns out, there are tons of awesome Creative Commons licensed otter photos out there! Many of them can be found on Flickr, but I did most of my searching using the Google Image Search tool; the Advanced Search options let you specify that you only want to find images that are available to do various things with (such as use and modify, even commercially). Fortunately, I don’t need a ridiculously large number of different otter pictures for my Otters game. There are cards with the number 1, 2 and 3 – so, three different otter pictures there. There are special cards that let you play an extra card, play the top card of the deck or move a card from one spot to another. 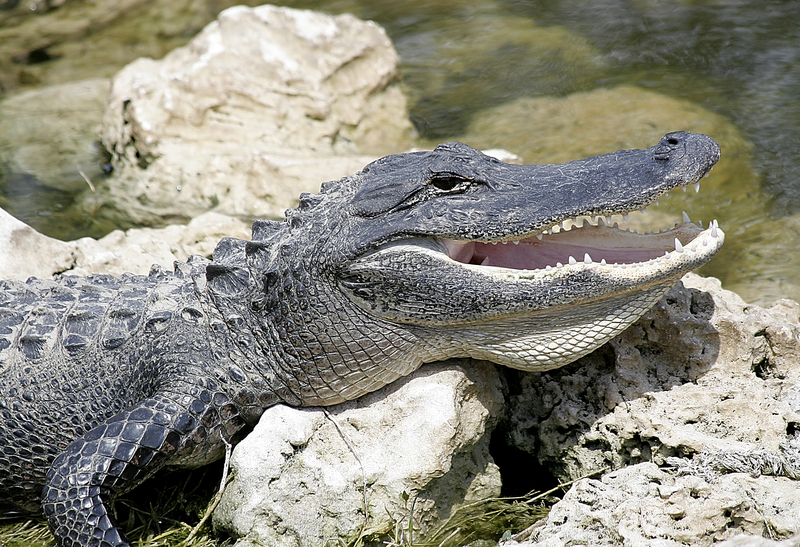 There’s also an alligator card. And finally, there are otter playgrounds, so I needed beautiful lakes. I’m working on picking the graphic designer now. If all goes well, I’ll have final, laid-out files soon! Last year I participated in National Game Design Month, better known as NaGaDeMon. In case you haven’t heard of it before, NaGaDeMon is inspired by NaNoWriMo – National Novel Writing Month. Instead of trying to write a 50,000 word novel in November, I’m trying to design a game. My effort last year was called Gods & Champions. It was the second game I tried designing (after Chaos & Alchemy), and while I ended up with some fun stuff, I ultimately realized that the core mechanic I wanted to explore just wasn’t that fun. I could have a fun game, but it would involve going in a totally different direction, so I decided to move on to other games instead. Let’s face it: Otters (especially river otters) are freaking adorable. As a kid, I loved the Christmas special called Emmet Otter’s Jug-Band Christmas. It featured adorable otter Muppets that sang and played musical instruments. Later in life, I visited an aquarium and was captivated by the cute river otters. So, for a few months now I’ve known I wanted to design a game themed around otters. I wanted it to be kid-friendly, and I wanted it to have adorable otter art. What would be the mechanics of this otter game? I had no idea. 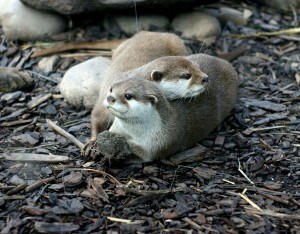 I started by researching otters and what they do. And while they’re adorable creatures, nothing about their lives really inspired any game mechanics in my mind. I let things just simmer. Then, a couple of weeks ago, I found myself playing a game that I really want to like but that I actually don’t enjoy much: Smash Up. The theme of Smash Up (pick two cool faction mini-decks, like ninjas and wizards, and shuffle them together) sounds like a lot of fun. The art is awesome. And yet the game has been a drag both times I’ve played it. Smash Up seems like it wants to be a simple, quick, wacky game, but most of the factions have some fiddly mechanics that can lead to analysis paralysis. It’s also quite fiddly to keep track of everything on the board; with all of the abilities from the base cards plus the ongoing abilities from the creatures and actions that have been played to those bases, it can be really hard to even know what the total value of cards at a base currently is. The game ends up taking way too long for the amount of fun it contains, in my opinion. 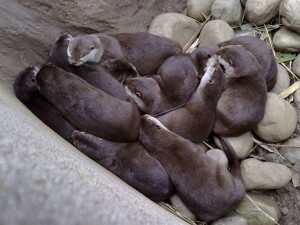 So, my idea for the otter-themed game: Take the basic idea of Smash Up (playing cards from your hand to shared “bases” on the table in an effort to bring the total value of the otter cards on a base up to a target number) and simplify it, using cards with pictures of adorable otters. Thematically, the “bases” will be playgrounds for otters (ponds, lakes and rivers). When you have enough otters in a playground to fill it up with fun, you score points for that playground. Typically, I make quick and dirty prototypes for the earliest designs of my games. However, since Otters is all about adorable pictures of otters, I started using cards with art right from the beginning. 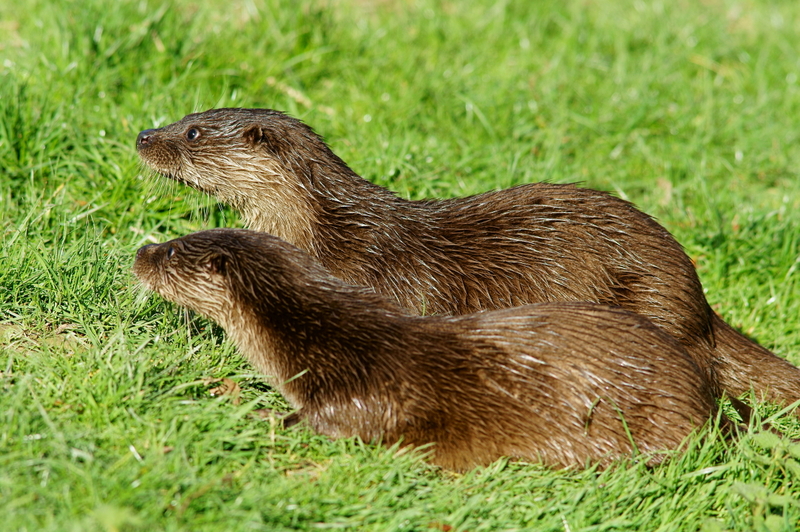 Now, I don’t personally own the rights to any otter photographs or illustrations, so I’m not going to show you what my prototype looks like here on my web site. 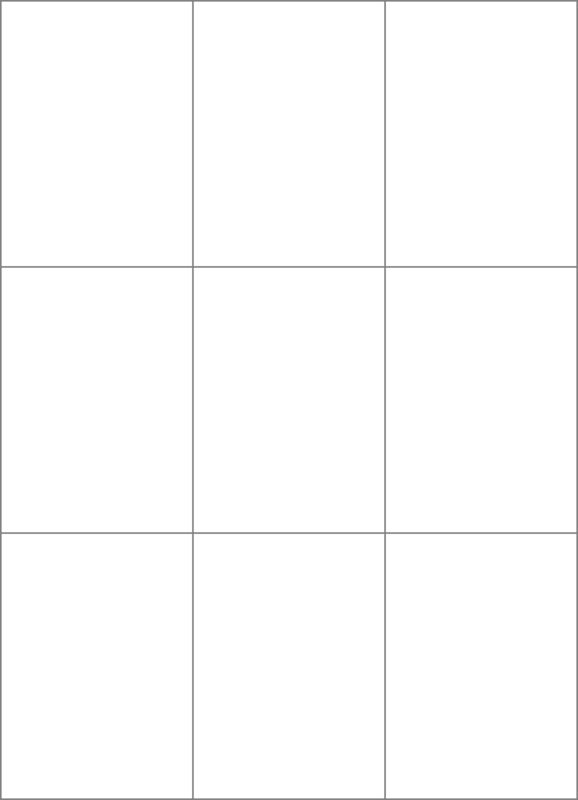 Suffice it to say, I found adorable otter pictures online and popped them into a simple template. 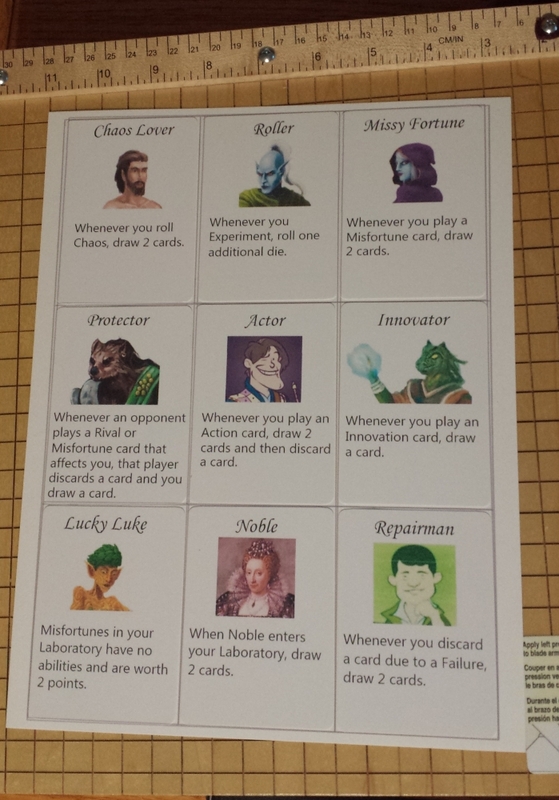 Playtesting – you can help! So far I’ve playtested Otters four or five times, with only small tweaks to the mechanics and rules along the way. It’s actually pretty much where I want it to be right now. Otters is a quick (10 minute) 2-player game that’s easy for kids but still contains interesting decisions for adults. I might end up trying to expand it for 3 or 4 players, but I’m pretty happy with where it is as a 2-player game. Furthermore, the only components are 54 cards. That’s it – no dice, no counters, no meeples, no board, not even some spare coins. Just a deck of cards. One of those cards is just a rules reference! I’m thinking I might ultimately make this game available via DriveThruCards or something like that. 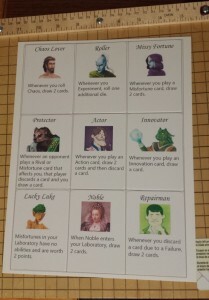 If you’re interested in helping me to playtest Otters, send me an email at ClayCrucible@gmail.com, and I’ll send you a PDF with the 54 cards of the game. I personally recommend printing them on regular paper, cutting them up, and dropping them into sleeves with Magic cards or something similar. Halloween 2013 saw the first meeting of the “nerd out” club at the local high school, which I have volunteered to help with. While the kids are talking about watching movies and sharing other nerdy fun at future meetings, the first meeting was all about board games. And since it was Halloween, costumes were welcome! I went as a minion from Despicable Me. When I arrived, the “meeting” was already in full swing. There were about 20 kids on hand, plus the teacher who is supervising the club. I spotted a game of Settlers of Catan getting underway along with a war game that I didn’t recognize. 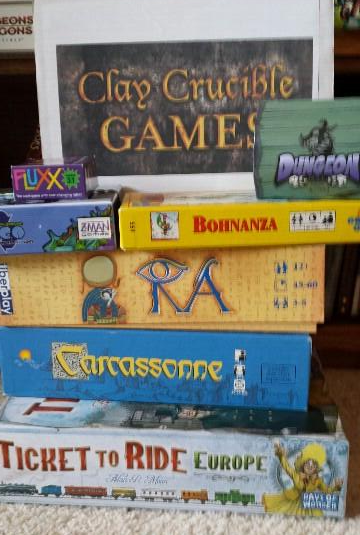 I had brought a stack of games like Carcassonne and Ra, along with a box containing my own designs. The teacher introduced me to the class as a local game designer, and I had about six kids come over to the table where I was sitting, interested in trying out a game with the designer. I taught a bunch of them to play Chaos & Alchemy. A couple of kids had to leave after a few minutes, while some others drifted in, so we had a bit of a fluid composition of players at the table. 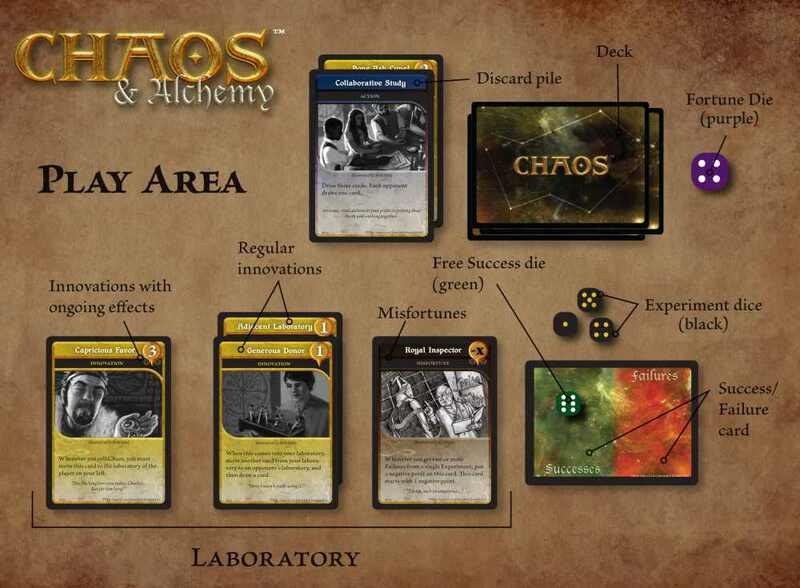 It turns out that Chaos & Alchemy was an excellent choice in that environment, since it’s easy for a player to leave and have someone else take their place (or just continue with fewer players if need be). We played once with the base game, and then a couple of times with the Apprentices expansion I’ve been working on. It went great! After that, I was down to just myself and one guy who wanted to play more of my games, so I broke out my super-early prototype of a game I’m calling Otters. It’s a quick and very simple card game, and I had only tried it solo before this, but it played pretty much the way I wanted it to. I’ll be writing more about this one soon, I promise; I think I might make it my National Game Design Month (NaGaDeMon) project. The club meeting only ran from 3:00 to 4:30, but that was enough time to meet a bunch of the kids, share some love of gaming, and get some play testing done. Next time, I’m probably not going to bother bringing games aside from my own designs; that’s what the kids seem most interested in. I’ll also go with a more structured plan in mind next time. I was expecting that I would be going around to different tables and teaching people to play different games, but the kids were already doing their own thing in many cases. I’ll go with the plan to teach / play test one particular game and let the kids who are interested in that game come to me. A few months ago, I noticed several online posts in the board game community where people were talking about their involvement with board game clubs at local high schools. Most of the time it was a teacher, but there were some cases where students were talking about these clubs, too. My own high school years ended just before the era of modern board games began, but I would have loved this sort of thing when I was in school. I decided to see if any club like this existed at the high school near my home so that I could volunteer to help out. Helping to build the next generation of board gamers seems like a great idea! The tricky part of this plan is that I’m not a teacher, nor am I even a parent. I discovered that you have to be sensitive when volunteering to help out at a school when you’re just a resident of the community (especially when you’re a man, I think). Ultimately, I had some good luck. I called the local high school and was given the email address of their volunteer coordinator. After I emailed her, she wrote back to let me know that she had heard that one of the teachers had agreed to coordinate a new “nerd out” club at the school, which would include board gaming. She gave me the teacher’s email address and let me know that I would need to fill out a volunteer application (which included a background check and references; pretty intense, but okay with me). I met with the teacher in his classroom one afternoon, along with a couple of the kids who were behind the idea for the club. Basically, the teacher didn’t really know anything about gaming, but the kids were so enthusiastic that he agreed to help out. I had brought a copy of my first game design, Chaos & Alchemy, and the kids wanted to play it on the spot. Fortunately, the game is quick, so they were able to try it and had a good time. The date was set for the first real club meeting: Halloween 2013. That’s today! I may trim this down by a game or two before I head to the school this afternoon, but this is my current planned line-up. What do you think? Are any of these bad choices for new gamers? Any obvious choices I’ve left out? I’m hoping that this ends up being a fun experience for the kids and a fulfilling experience for me. 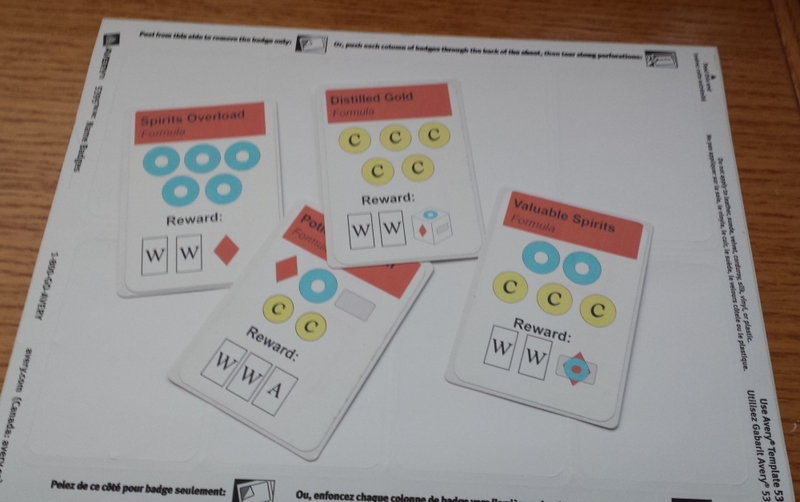 I’d love to teach young people about how much fun board games are, and if any of them are interested in learning to design their own games I’ll be happy to help teach them that, too. Has anyone else out there been involved with kids and gaming, especially in schools? Any advice for me? Continuing my series, I’m going through the Kickstarter projects I’ve backed, in chronological order, noting why I backed each project, what level I backed at, and how it turned out. Part 1 of the series, covering the first 10 games I backed on Kickstarter, is here. Part 2 is here. Why I pledged: Folks I follow on Twitter were talking about it. They had a fairly inexpensive e-book option. And hey, who doesn’t love a geeky dirty story? How it turned out: I got the e-book, and I’ve read a few of the stories. They’re pretty good! Probably not really worth $20 on the merits, but I was happy to support some good folks in the geek community, so I’m fine with it. 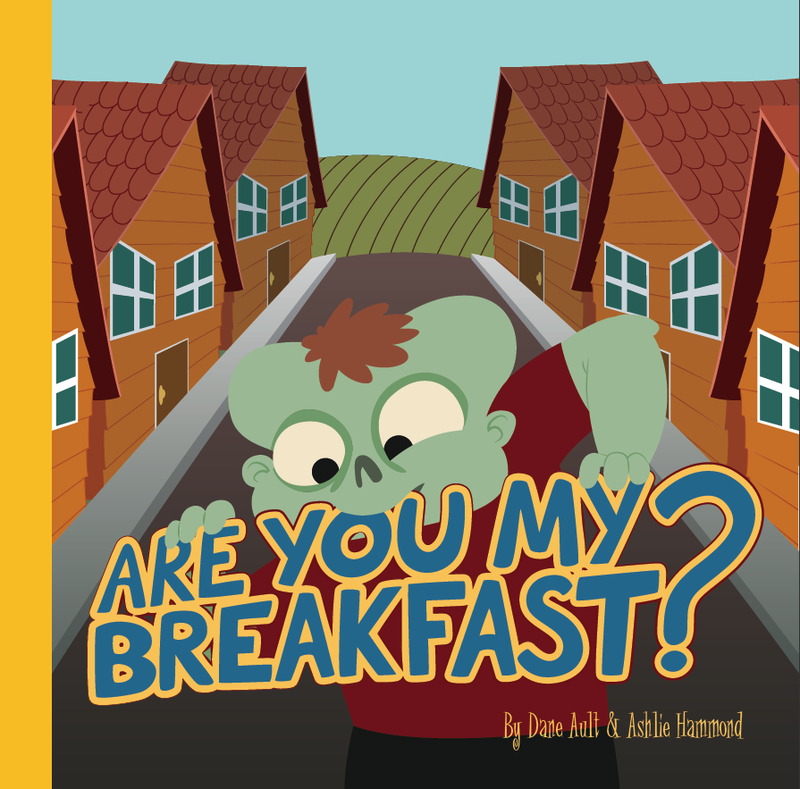 My pledge: $25 for a copy of the book, plus the e-book version. How it turned out: Freaking awesome! I devoured the e-book as soon as it arrived, and I treasure my physical copy. Why I pledged: Because I didn’t own enough geeky T-shirts, and I thought some of the shirts they were offering looked cool. My pledge: $34 for two shirts. How it turned out: Great! I like my “Shirt +1: Protection from Nakedness” shirt, and my wife’s “Boobies of Distraction +5” is awesome, too. My shirt was a little on the small side, but I’ve lost about 15 pounds since I got it and now it fits perfectly. The shirts even arrived in time for Christmas last year, so I could give my wife hers as a surprise gift. Why I pledged: How could I not? These rings looked so cool. And did you see that video? Worth the price of admission all by itself. My pledge: $15 for a ring, although I upped my pledge later to get three rings (I believe this put me at $42 or something like that). How it turned out: Awesome! I got a ring for myself, one for my wife, and one for my brother-in-law. Everyone loves them. Plus, the Crit Success guys were at Denver Comic Con and I was able to exchange my ring for a slightly larger size (it fit my left ring finger, but I decided that I would prefer to wear it on my right ring finger, which it turns out is slightly larger). Why I pledged: I wanted to support Tom Vasel (one of the designers of this game) because I have gotten so much enjoyment from the Dice Tower podcast. How it turned out: Funny story. I actually backed this game while knowing next to nothing about it; I just wanted to support Tom. Once I actually heard what the game was about (months later), I realized that it was a game that I wouldn’t enjoy playing. So, I used the BGG marketplace to sell my copy (unopened) for the price I paid to someone who actually wanted it. I guess that’s a win! In addition, my backing of this game indirectly led to Chaos & Alchemy getting published. (You can find that story here, in the pre-pre campaign section.) So, extra win! 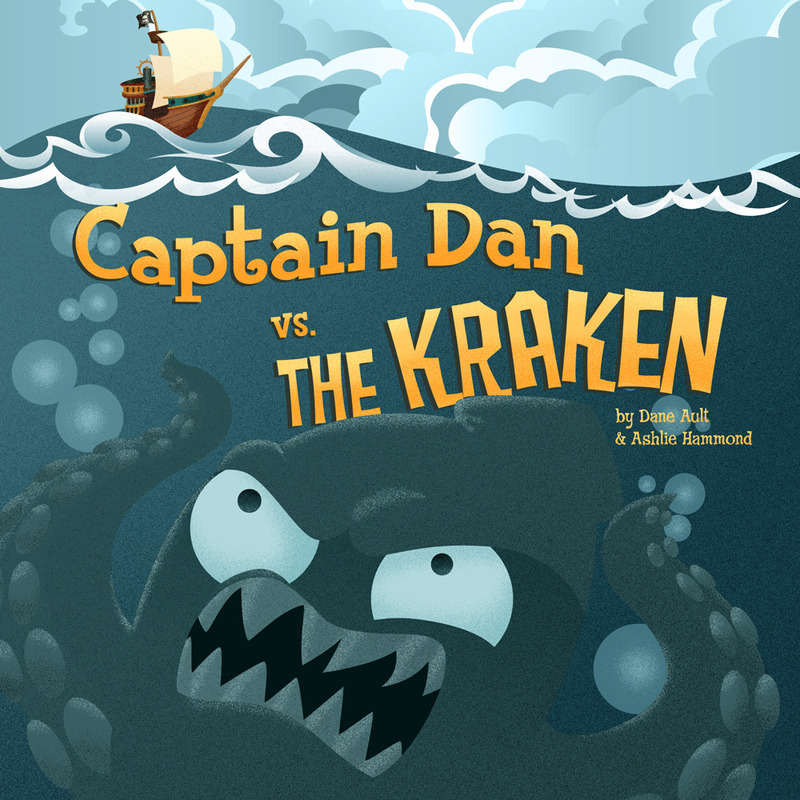 Why I pledged: Ten bucks for the e-book version of the game – why not? I had enjoyed what I had seen of FATE from my earlier backing of Race to Adventure, which came with a free e-book of the FATE-using Spirit of the Century, and I liked it. My pledge: $10 for the e-book. How it turned out: Awesome. I loved reading this game, which I did in fact read cover to cover. I have yet to play it yet, but I want to. Hard to beat that for ten bucks. Why I pledged: I loved Choose Your Own Adventure books as a kid, and I like Shakespeare. Plus, the campaign looked hilarious. And the price was right. How it turned out: Fantastic! I spent several days going through the e-book version, and it was genius. Seriously, this book is hilarious; I highly recommend it. The physical version rocks, too. Go buy it! Why I pledged: I’m not sure, really. Something about the game intrigued me. My pledge: $40 for the game plus the board and box. How it turned out: Um, I haven’t actually played it yet. I guess that means it didn’t turn out great, since I haven’t been motivated enough to get the game to the table. Hm. Why I pledged: I had gotten several years of enjoyment from EN World, and I wanted to support them. I also wanted the e-book version of the first five ZEITGEIST adventures. How it turned out: Well, okay, I guess. I had forgotten that I backed this, actually. I guess I should go see if I can download those adventures. But either way, I just wanted to give one last thank you to EN World; I never go there any more. Why I pledged: As I mentioned with Nothing Personal above, I have gotten a lot of enjoyment out of the Dice Tower, so I wanted to say thank you. My pledge: $1, to say thank you. How it turned out: Well, they’re thanked! Part of the reason I didn’t pledge more was that I had already supported Tom with Nothing Personal, and I had also paid for a bunch of advertising on the Dice Tower when I was planning to run my own Kickstarter campaign for Chaos & Alchemy. Still, I figured I might as well toss a buck in the virtual hat. As I mentioned in my last update, I’m at the point where I’m going to stop these recaps for a while, to give the next few projects I backed some time to catch up. But I do have something interesting coming – a guest post from a friend of mine who decided to go through this same process for the first 10 projects he backed on Kickstarter! I’ll post that soon.